When a dead body is discovered in Port Telvannis, it is the start of a vendetta. 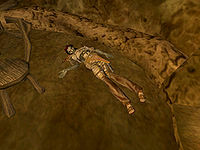 10 I have discovered a body in a small housepod located in the Telvanni capital of Port Telvannis. Perhaps I should report this to the guards or investigate further myself. 15 There is nothing on the body indicating who might be behind this crime, though from the signs of it the victim was murdered by magic. From his gear he appears to have been a scout or agent, perhaps he was employed by one of the local Telvanni nobles. 20 I have described the body to a local guard here in Port Telvannis, and he has indicated that the victim is likely Redram Oran. The guard also informed me that he was a retainer of Rantela Irenam, who can be found in a manor not far from the housepod where the body was discovered. 21 A Khajiit slave in the Irenam Manor has informed me that the body I found in Port Telvannis likely belongs to Redram Oran, a retainer of the slave's master. 30 Rantela Irenam will not speak to me. Perhaps I should discuss the matter of Redram Oran's corpse with her apprentice. 100 Finishes quest Rantela Irenam has thanked me for informing her of the demise of her retainer. She has paid me one hundred pieces of gold for my information, but does not wish to burden one of such high rank in Great House Telvanni as myself with finding the culprit. 101 Rantela Irenam has thanked me for informing her of the demise of her retainer. She has asked me to investigate this matter more fully for her continued favor, as she called it. 110 Finishes quest I have spoken to Nevus Ilneram about the body of Redram Oran that I discovered in a nearby housepod. He thanked me for my time and paid a sum of 25 Septims. He also politely asked me not to become further involved in this matter, as it pertained to those who were members of Great House Telvanni. There is nothing more I can do. 10 Rantela Irenam has asked that I investigate the disappearance of her retainer by the name of Redram Oran. He has not reported to her in several days now and she fears that he has abandoned his duties to her. She has told me that he owns a housepod just to the east, on the ground level, and has given me the key so that I may let myself in, since the door will be locked. 20 Redram Oran's door was not locked and there is a body on the floor of his housepod which is likely Redram Oran himself. I should report this to Rantela Irenam or perhaps the Port Telvannis guards. 25 There is nothing on the body I found in Redram Oran's house indicating who might be behind this crime, though from the signs of it the victim was murdered by magic. I still cannot be certain that this is indeed Redram Oran. 30 I have described the body to a local guard here in Port Telvannis, and he has indicated that the victim is Redram Oran. The guard told me to report the death to Rantela Irenam. 101 Finishes quest Rantela Irenam has thanked me for informing her of the demise of her retainer. She then demanded that I investigate this matter more fully for her continued favor, as she called it. 10 Rantela Irenam has informed me that she hired Redram Oran to watch her bitter rivals, Varrac and Tinera Odrethi, who live in the nearby Odrethi Manor. She believes that he was discovered by either Varrac or Tinera, and they are responsible for his death. Since no evidence of their responsibility was discovered near the body, I have been instructed to enter the Odrethi Manor undetected and find such evidence, if it exists. I am to take any evidence back to Rantela Irenam. 11 To gain entry to the Odrethi Manor I have been given a powerful potion of shadow, that was brewed by Rantela Irenam. She told me that it will allow me access to the manor but may not last long enough for me to find what I am looking for. I was told it is my responsibility to find a solution to this problem. She told me to be quiet and warned me about wearing boots while performing this task, as it is necessary that the theft go undetected for some hours. 15 I have found a report in the Odrethi Manor which details the activities of the Odrethi houshold and seems to have been penned by Redram Oran. 20 My movements were detected by a member of the Odrethi houshold; I must have made too much noise while moving around. 30 I was seen by a member of the Odrethi Household and was asked to leave. 35 I obviously did not leave the Odrethi Manor quickly enough when asked and was attacked by various members of the household. 40 I have killed Varrac Odrethi. 41 I have killed Tinera Odrethi. 100 Finishes quest I have elected to not investigate Redram Oran's death. 202 Finishes quest Rantela Irenam was pleased that I found the report confirming her belief that Redram Oran was murdered by either Varrac or Tinera, but she says that she can no longer use my services as I was seen taking the report. She has provided only meager compensation for my assistance, and her disappointment in my failure was evident. 450 Finishes quest Rantela Irenam was displeased that I killed a member of the Odrethi family and attacked me. 500 Finishes quest Rantela Irenam was pleased that I found the report confirming her belief that Redram Oran was murdered by either Varrac or Tinera and says that she is formulating a plan for revenge. I was compensated for my assistance. 501 Finishes quest Rantela Irenam was pleased that I found the report confirming her belief that Redram Oran was murdered by either Varrac or Tinera and says that she is formulating a plan for revenge. She says that once the theft is known her manor will likely be watched closely by spies of the Odrethi household, and thus I should confer with her ally, Inera Ilneram, about furthering this plot for revenge, to my benefit of course. 10 I have spoken with Inera Ilneram about avenging the death of Redram Oran. She has devised a plan to implicate Varrac and Tinera Odrethi as Imperial spies. I have been given a message that has been poorly ciphered in a known Imperial code. I am to plant this message on the slave in the Odrethi Manor, after putting him under a command spell. Then I should order the slave to go to the docks to seek passage to Firewatch; afterward, I should alert the guards to the slave's intentions. 11 I have told Varrac and Tinera Odrethi of the plot to implicate them both as spies for the Empire. They have asked that I betray Rantela Irenam instead by performing the deed on her slave. 100 I have placed Oka-tei under the command spell and given him the encoded document. I then ordered him to the docks to search for transport to Firewatch. 101 I have told a guard here in Port Telvannis that I overheard that Oka-tei was acting as a courier for Imperial spies. 102 Inera Ilneram has thanked me for my efforts and asks that I return in two days for my reward. 109 Finishes quest Inera Ilneram was pleased by my success at setting up Varrac and Tinera Odrethi, but says they managed to talk their way out of trouble by claiming that the slave was new and was acting of its own volition. While the incident was embarrassing, no lasting harm was done to either Odrethi. In any event I was handsomely rewarded for my part in scheme. The slave was tortured and put to death, though he proclaimed his innocence. 110 I have placed Oka-tei under the command spell and given him the encoded document. I then ordered him to the docks to search for transport to Firewatch. 111 I have told a guard here in Port Telvannis that I overheard that Oka-tei was acting as a courier for Imperial spies. 112 Inera Ilneram has thanked me for my efforts and asks that I return in two days for my reward. 113 Varrac and Tinera Odrethi know that I am responsible for Oka-tei's recent actions. They are now hostile. 119 Finishes quest Inera Ilneram was irate that I told Varrac and Tinera of her plan for revenge. She threw me out of her house but refrained from actually attacking me. The slave was apparently put to death anyway. 120 I have placed J'Sanda under the command spell and given her the encoded document. I then ordered her to the docks to search for transport to Firewatch. 121 I have told a guard here in Port Telvannis that I overheard that J'Sanda was acting as a courier for Imperial spies. 122 I have been thanked by Varrac and Tinera Odrethi. They have told me to return in two days for my reward and to learn the results of my efforts. 123 Rantela Irenam knows what I have done to J'Sanda. She has attacked me. 124 Inera Ilneram knows that I betrayed her, and she seeks to kill me over it. 129 Finishes quest Varrac and Tinera have rewarded me for assisting them, but were disappointed that Rantela Irenam escaped justice, as they called it. She claimed that she had been too lenient on her slave and was embarrassed, but managed to avoid permanent trouble. I was warned that she likely knows of my hand in this matter and to be careful. 350 I have killed Varrac Odrethi. 351 I have killed Tinera Odrethi. 352 I have killed Inera Ilneram. 353 I have killed Rantela Irenam. 400 Finishes quest Inera Ilneram has attacked me for killing a member of the Odrethi household. 401 Finishes quest Rantela Irenam has attacked me for killing a member of the Odrethi household. 402 Finishes quest Tinera and Varrac Odreth were quite angry that I killed Inera Ilneram. They claim that this will complicate their future in House Telvanni and have attacked me. 403 Finishes quest Tinera and Varrac Odreth were quite angry that I killed Rantela Irenam. They claim that this will complicate their future in House Telvanni and have attacked me. 404 Finishes quest Tinera and Varrac Odreth were quite angry that I killed Inera Ilneram and Rantela Irenam. They claim that this will complicate their future in House Telvanni and have attacked me. 500 Finishes quest I have decided not to help Inera Ilneram and Rantela Irenam get revenge for the death of Redram Oran. This page was last modified on 17 March 2019, at 00:03.